Call us if you need help with catering for your next event or party. We offer party trays and platters that are sure to please any crowd. Visit our Events page for more information. 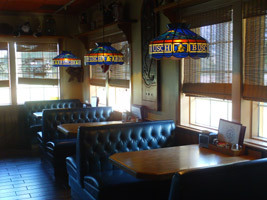 We are a full service restaurant with a seating capacity of 98. If you have not visited us we welcome you or your family to stop in and give us a try. If you are a long time customer we Thank You for continuing the Wagon Wheel Pizza Family Tradition. Keith Elwood grew up in the family restaurant business. His parents owned Wagon Wheel Pizza in Melbourne. In 1981 Keith's parents made him a partner and encouraged him to work hard and build the business by giving him a "piece of the pie". 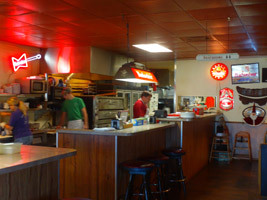 The present location of Wagon Wheel Pizza, purchased in 1998, has become Palm Bay icon. Groups of 30+ can be served with room for other diners. 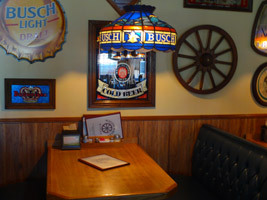 The beer memorabilia collection gives a unique dining experience. Keith continued the family tradition by following the premise that the secret to success is consistently give your customers a great product, great service at a fair & reasonable price. Consistency is key, so customers know what to expect every visit. 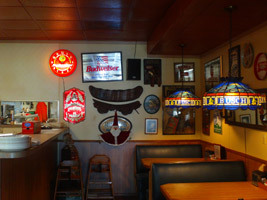 Wagon Wheel Pizza offers and extensive menu including Pizza, Strombolis, Calzones, Wings, Subs and traditional Italian favorites. We also have Party Trays and Platters for your next party or special event, making your job a little easier.